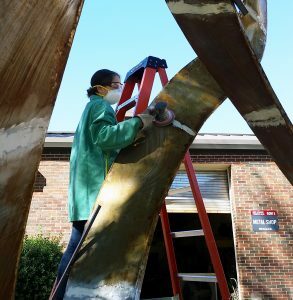 Towering steel flowers, a massive mathematical loop-de-loop, larger-than-life baseball players and renown university presidents are just a few of the projects, supervised by Professor of Art Craig Wedderspoon, that have been created in the giant work bays at UA’s art foundry. 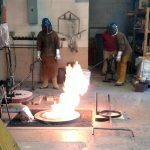 From Tuscaloosa to Gadsden, sculptures from the foundry find homes around the state. 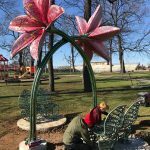 It takes skill and determination, caution and daring to see complex design projects grow from drawings and models to finished public sculptures. Wedderspoon and his team – foundry specialists Eric Nubbe, Joe McCreary and Ringo Lisko, with senior arts technicians Patrick O’Sullivan and Mike Eddins – work with strict safety standards and an inventiveness that keep all the machinery running smoothly behind those gigantic sliding garage doors on Margaret Drive. Now, a monumental new sculpture, cast in the foundry, is ready to become part of the Woods Quad Sculpture Garden. 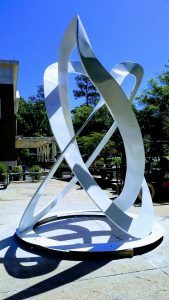 Mobius and Borromean Rings is designed and created by marketing major and studio art minor Paget Kern. Kern, who has taken sculpture courses for her art minor and makes jewelry at home, designed the work in a collaborative project with students in the departments of Math and Art and Art History. She linked two complex mathematical ideas together in a massive sculptural example. Kern explained that the design is “a triple Möbius strip tied together in a Borromean knot.” We’ve all seen the three inter-linked rings of a Borromean ring or knot. A Möbius strip can be made by twisting a strip of paper and adhering the ends together to create a continuous circle that is “unorientable.” If you walked along a center line on the loop, you would go around the Möbius strip twice before coming back to its starting point. The long and the short of it is that you’ll have to go see the sculpture for yourself when the giant twisted loops of welded steel sculpture are installed in the Woods Quad Sculpture Garden this summer. 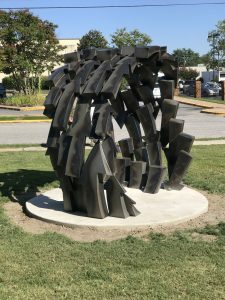 Up north in Gadsden, alumnus and staff member Eric Nubbe’s public sculpture, commissioned by Walnut Gallery on behalf of the Gadsden Public Library, has been installed in the green space in front of the library. Just in Time is 7 feet high, 5 feet wide, 7 feet long and made of steel. 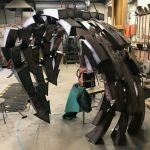 Nubbe is working on a second sculptural project for the City of Florence’s bicentennial celebration to be fabricated in the foundry: a 20-foot steel musician overlooking the Tennessee River. Past projects of the foundry include a statue of past UA president and UA System Chancellor Robert Witt in Presidential Plaza on UA campus; the nine-foot tall statue of Willie Mays in Regions Field; student-designed and -built bicycle racks in Alberta Park and downtown Tuscaloosa; Amaryllis and accompanying park benches by undergrads Lisko and Amber Daum in Monnish Park; and iron benches for Schoolyard Roots (Druid City Garden Project); among others. The most intensive upcoming projects are related to Tuscaloosa’s and Alabama’s Bicentennial celebrations in 2019. They were competitive commissions awarded to Tuscaloosa artist Caleb O’Connor, Wedderspoon and the foundry. For the state’s commemoration, O’Connor designed sixteen 3-foot by 2-foot high relief bronze panels depicting scenes from Alabama’s history to be cast at the foundry and paired with sixteen interpretive text panels. The entire work is scheduled for unveiling in Montgomery in December of 2019, so mark your calendars!